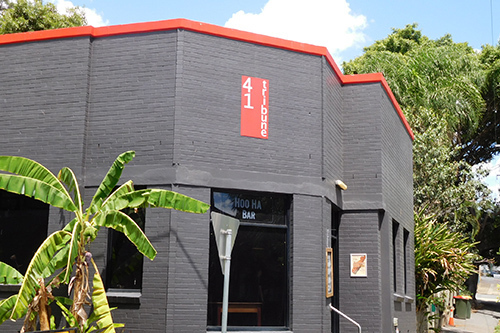 The tag line for Hoo Har Bar is local food, independent coffee, crafty drinks. This sums it up neatly. The décor has a rustic charm to it and I imagine it is atmospheric at night with comfy lounge chairs and regular live music. The scenic photography and anonymous sketches of the bar managers on the walls are amazing. You can book a table ahead of time if you like. We went to Hoo Ha Bar for lunch on the weekend. I enjoyed a delicious lamb back-strap sandwich with chips on the side. The portion size was generous, which was a good thing because it kept falling off the wooden chopping board it was served on. You could choose from one of their many bagels (BLT, mushroom, avocado or salmon) or a salad. The TAFE students are spoilt for choice with their coffee options. There is a different menu for breakfast and another for after 4pm. There is a great range of bar snacks. Hoo Har Bar specialised in craft beer and I wonder if you have heard of any of these brands – Green Beacon, Mountain Goat, Two Birds, 4Pines, All Inn Brewing Co and Rocks Brewing? There is a huge selection of cocktails and mocktails. I have to admit I was a little intrigued by the gingerbread and apple pie milkshakes. The food and bar menus are constantly changing at the Hoo Ha Bar, so you are bound to find something you like. The bar is located just next to the South Bank train station, so you have no excuse for not taking public transport home after a big one. Join Hoo Haa Bar's facebook page to keep up to date with their latest brews and news.